Not too many people have heard of this brand that makes small leather goods, bags, briefcases & travel pieces. In fact, the only physical retail outlet in the US for Valextra is Barney's New York so unless you have a BNY in the city you live in, the likelihood of you seeing a Valextra leather goods for sale is slim to none. I really admire the craftsmanship and understated elegance of Valextra pieces. There are no big logos, no splashy designs, no celebrity campaigns. The quality of the pieces speak for themselves. Every piece of Valextra is handmade to perfection; stamped by its maker and numbered. The simplicity of the design means hardware, leather, and stitching needs to be spot on. If you are looking for trendy hand bags, then Valextra is not for you as they produce the same design pretty much year after year with few new ones here and there. This 75 year old company was founded in Milano on March 21, 1937 by Giovanni Fontana. He had a very good sense of what was elegant and what sells. His 24hr travel piece was awarded Compasso d'Oro Prize (the oldest industrial designing award of Europe and one of the greatest honors of industrial designing in the world) in 1954. 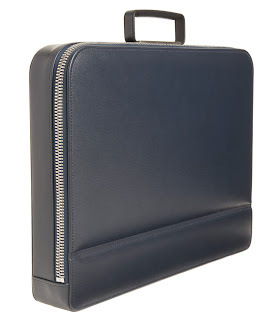 He also hired famed A.G. Fronzoni (graphic designer and architect who's work is collected in MOMA's permanent collection) to design several pieces for the company including my favorite Premier attache case. Not only they sell leather goods, they also can make one of the kind pieces for you. Maria Callas wanted a hippopotamus leather hat box? Done! An order of complete set of fourteen elephant skin cabinet trunks and luggage for Emir of Kuwait? Completed!